This past August I read a book on vacation called 7: An Experimental Mutiny Against Excess by Jen Hatmaker. While reading I felt completely motivated to implement some of her ideas from the book. Being totally inspired by her first chapter on food I convinced my husband that we should do a 21 day fast, like Jen's friends in the book had done. The fast consisted of picking seven of the world's poorest countries, eating like they do for three days each, all while learning about the country's people and culture at the same time. He agreed and thus exactly two days after returning home from vacation where we had eaten anything and everything to our hearts content (our families menus get more elaborate each year, think: smoked ribs, fish tacos, grilled pizza, pork tenderloin and every treat and snack known to man) we shocked our systems by narrowing our diet to mainly two things: beans and rice. Oh, we had a few days were we would incorporate plantains, a corn tortilla or chapati, but overall we ate rice, and lots of it. The mantra in our house anytime our kids would ask why we weren't eating meat: "Meat is rich people food!" But beyond just the aspect of food, it has changed my life and shifted my perspective. Following are some of the things I learned while in the process, and realizations I’ve come to in the days since the fast ended. We eat way more food in a day than our bodies actually need. I’m just talking consumption, not necessarily what we put in, just the quantity of food. I found you can actually survive by only eating once, sometimes twice, a day. And for many places around the world, this is their reality. In fact, the people in each of the seven countries we chose eat only once a day, twice if they are lucky. We eat oftentimes out of boredom, as a way to comfort ourselves or just because we’re used to doing it. Ex: I’ve always eaten a snack before bed, so why wouldn’t I now (even if I don’t actually feel hungry)? This was a big one for me. I never realized how often I use food to offer myself comfort: I’m upset so I’ll just allow myself this extra piece of chocolate, that always gives me a little boost or These kids are being so naughty today, I can’t wait til they’re in bed and I can have a glass of wine by myself or This week has been so crazy, I’ll get a babysitter so Kyle can take me to [insert favorite restaurant here], I could really go for some [insert favorite dish here]. I was surprised how these thoughts came up for me almost daily and I found myself struggling a bit. Without food as my go-to comfort, what would I do now? Where would I find that comfort? I didn’t have a clue how poor the rest of the world really is. Oh, on some level I did, we all know there are starving children out there, but it’s not really ever been on my radar screen…and I’m ashamed to admit it. I’m ashamed that I just threw away the little bit of dinner that was left tonight because everyone had had their fill and I’m ashamed that I can be so flippant about knowing there are starving people all over the world tonight, but never really doing anything about it. In fact, just this week, I heard someone talk about how their children are “starving” when they get home from school. And I thought, Really, they’re starving? And I know I say it too, yet I wonder if many of us truly know the meaning of the word? I can survive without coffee. I know I sound dramatic, but you have no idea how much I love it. Portion control. I want to continue to be so much more aware of how much I’m putting into my body and why. So many times when I would want to turn to food, I would pick up my Bible instead. What choice did I have? But God would meet me there. He would fill the void that I so often had turned to food for, and he would bring me peace when I needed it, healing, and oftentimes, joy. And it felt good to realize I was going to the ultimate place of restoration, instead of a cheap substitute that never truly filled me up. Although I don’t think I’ll ever fully comprehend the plight of the poor, I don’t feel as disconnected as I once did. 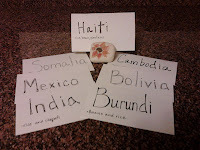 In fact, my heart is broken for the hungry around the world. I still cry when I think about those in Haiti and India who are so hungry they will eat mud, just to alleviate the hunger pangs for a short time. I still see faces of children who are starving, but instead of making me feel guilty, it motivates me to want to do more. I want to send money to feed those in the midst of a famine in Africa; I want to continue to pray for God to meet the basic needs of the people in Somalia; and I want to pray for missionaries to go to Cambodia who will share the love of Jesus with those who don’t know. My world has gotten very small, and I feel burdened for those I do not know, may never meet, but who everyday I am reminded that God sees: He knows their names, and he cares, just as much for them as he does me. I now have a new desire: Lord, let my heart beat in turn with yours, let me care about what you care about. And everyday he is answering that prayer, that desire, more and more. We will continue fasting, once every month for three days. My kids, surprisingly, loved this fast. Even still, Jasmine will ask every night, “Who are we eating like tonight?” They enjoyed learning about other countries and praying for the people there. I didn’t realize that more than just myself; this would be an eye-opening experience for my children as well. So we have committed to doing one country every month, for three days. In fact, in October we will be eating like the poor in Romania, mainly because my brother-in-law, Marin, is from there and has agreed to come and talk with our family about what it was like for him to grow up there with his family and be very poor. All while making us traditional Romanian food: I can’t wait. You moms will appreciate this next point: No matter how much weight you lose, if you don’t exercise, you will still be flabby. Translation: Even though I lost quite a bit of weight, I still have my “mom arms” or, as my sister Kristin likes to say, “the double wave” arms (You wave your hand, and it waves, too). Seriously, this is just not fair. One final thing I’ve realized now that I’ve completed the fast: I don’t believe God opens our eyes to condemn us, I believe He does it to convict us. To motivate us. To desire something more out of life than just what we can get here in America. To move beyond this American dream that says: I’ll get not only what I need, but what I want, and I’ll take care of mine before I do anything for anyone else. God showed me that one of the biggest lies American Christians (myself included) believe is that we are somehow not the wealthy of the world. That we have a responsibility to take, keep, and store up what is due us, what we have a right to have. Never fully realizing that we are wealthy, that most of the world doesn’t live like us. Most of the world wonders if they’ll have shelter tonight, food to eat, or work available tomorrow. It's not that I believe we don't care - Christians are some of the most caring people I know - I think we just don't always allow the heartache of what is happening in the world to get to us. And there are good reasons not to. As Julie likes to remind me, the world is messy, and you get dirty when you go out into the midst of it. And she's right. Sometimes, I don't want to know; sometimes, it's easier to just keep it off my radar, out of my view. But God is opening my eyes more and more and I am running out of excuses not to see or notice and not to do something. We have a responsibility to understand that God has blessed us, gifted us, to be here and that we now are charged to take care of others. Time and again, I am struck by how often in scripture it says: take care of the poor, provide for those without, and see the needs that are all around you. It’s time we opened our eyes and hearts to the real issues at hand. This post contains an affiliated link.